Best Of Shocked and Amazed! | Shocked and Amazed! Best Of Shocked and Amazed! 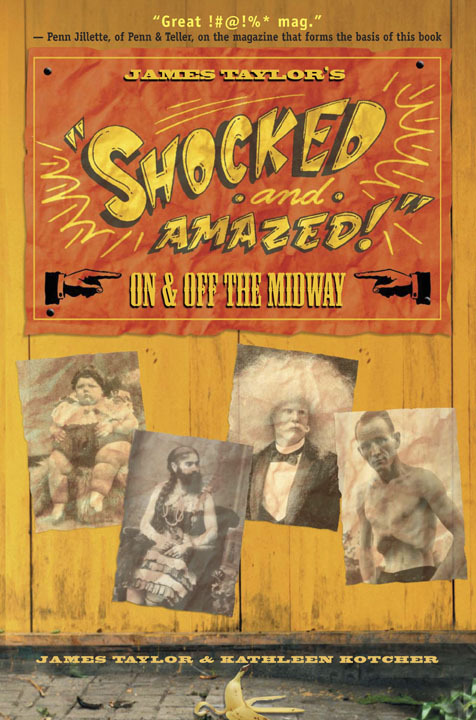 As the world’s only publication devoted to sideshow, James Taylor’s Shocked and Amazed! On & Off the Midway is chock-full of carnival and circus midway madness and mayhem. Hear the truth behind this uniquely American art form from the lips of the human marvels themselves! Shocked and Amazed! invites you to explore and satisfy your curiosity for the strange, the weird, the bizarre, the odd and the unusual. Witness never-before-seen photographs from the personal collections of sideshow superstars from yesteryear! 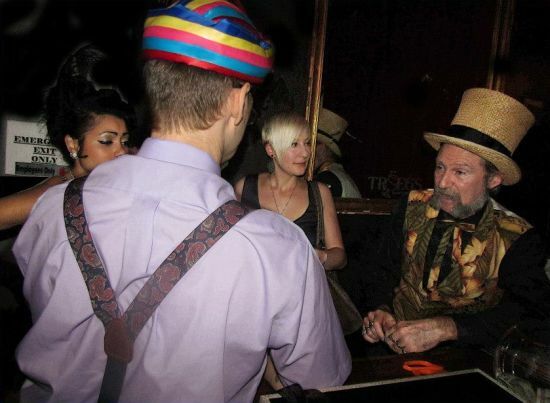 Marvel at the sideshow stories presented personally for your pleasure by sideshow performers! Thrill to these titillating tales of laughter and woe on the sawdust trail from the likes of: Frank Lentini, who could kick a football the length of the midway with his third leg; Melvin Burkhart, the Human Blockhead who could pound six-inch spikes into his head; Harold Huge, the sideshow fat man who needs “Six Gals to Hug Him, and a Boxcar to Lug Him”; Percilla the Monkey Girl and her husband, Emmitt the Alligator Skin Man; Bill Durks, the Man with Three Eyes and many, many more. 6 Responses to Best Of Shocked and Amazed! I am trying to find out more information about a one-exhibit traveling sideshow from the 1950s. I lived in a small town in West Texas so I would imagine that it didn’t go to the bigger cities. This traveling show featured a small person (dwarf?) who was only about 2-3 feet tall and rocked back and forth, made some kind of humming (?) noise and ate bugs from the floor. He didn’t exactly look like dwarfs because they were so short but they seemed to have a normal-size head. He was extremely dirty. Are you familiar with this sideshow oddity? Sadly, that one’s going to be tough to nail down. A small show visiting a small West Texas town from nearly six decades ago could be a small, ragbag of a sideshow or it could have been a show that played with bigger carnivals but was just “hopscotching” from bigger to smaller carnivals to keep the money flowing when they had dead weeks between spots. The town, the year, and anything else you could remember about the show might help. And by “one-exhibit traveling sideshow” do you mean that this performer was the show’s only performer? It does sound like, though, the performer you saw – small but with, I’m guessing, a smaller than “normal-size” head – might well have been a microcephalic or “pinhead,” as they call them in the business. Honestly, that might make it somewhat easier to work with, as pinheads were much less common on shows than, say, dwarves. Do you remember anything about the costume/outfit of the performer? What did his/her act consist of? And by “ate bugs from the floor,” was that a set up act (a showman dumping bugs on the floor for the performer to eat) or was that just what you observed the performer doing in the course of that rocking & humming. Anything about the act might be a help. Thank you for your response. This exhibit took place in Kermit, Texas, and about 1956. It seemed like the individual had a normal-sized head and a scraggly beard. I don’t think he knew what was going on as he seemed totally oblivious to the customers. It was very dirty and he was picking up the bugs with his fingers and eating them. I don’t think the host had tossed the bugs out – I think these were just bugs crawling around. I don’t think this was connected to any carnival – it was about the size of a small railway car and the ramp was made of wood where you had to walk up it to get inside. Another comment: I felt very sad for the man eating the bugs and I would venture to say that he was probably abused. Well, sadly, much as I was hoping some details would help, not so much. I talked with my partner in this, D.B.Doghouse, and this sounds like a kind of low-rent geek show/”drug show” (where the performer is billed as what would have been called a “wild man” in the 1800s, a “burned-out drug addict” in the 20th century shows). And if this were a small carnival, those characters came and went on such a frequent basis – and with virtually no recorded history – that pinning it down would be nearly impossible. It might’ve helped to know the name of the carnival, but that might’ve been a non-starter, too: Small shows such as this often bounced from carnival to carnival trying to keep the money coming in, yet another problem with IDing talent. Sorry we couldn’t give you more than the broadest of pictures on this one. Appreciation to my father who told me concerning this blog, this web site is really amazing. "Best Of" Shocked and Amazed!